In two varieties, either Hairless with tufts of hair or Powder Puff, the Xoloitzcuintli has bat-like ears and a graceful antelope-like neck. The Powder Puff's fur falls in heavy folds over its body and neck. Xolos are sweet companion animals. The hairless variety of Xoloitzcuintli require skin maintenance, including sunscreen, protection from the elements, teeth and nails also require regular attention. The powderpuff variety is an average shedder and should be brushed regularly. Xolos have no doggie odor and are excellent pets for allergy sufferers. The Xoloitzcuintli is highly trainable and has been bred as a companion dog. Affectionate and adaptable, children should be taught to be kind to this sweet breed. 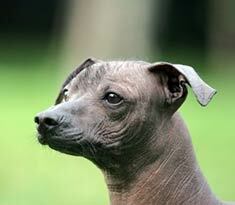 The Xoloitzcuintli can be expected to live about 12-15 years. The Xoloitzcuintli does not do well in extremely cold climates. The hairless variety is also highly susceptible to sunburn. The Xoloitzcuintli is a family dog and does best living with its family. The Xolo does not require a lot of exercise and is happy to romp, play and go on walks. This breed makes an excellent companion for the elderly. Find Xoloitzcuintli Puppies with our Free Breeder search!